Bring guests their check with the AL-300 durable Guest Check Presenter from Pegasus Ventures made using elegant soft vinyl with a golden "Thank you" imprinted on the front. When you open it there are slots for bills, cash and a credit card slot on the top. GuestCheck™ holder with storage pocket. The AL-300 holds single and duplicate GuestChecks up to 3.5? x 6.75?. There are 5 AL-300 guest check holders in each case. Sold by Pegasus Ventures ship the AL-300 ships the same business day when orders are received by noon Eastern. All other orders ship the next business day. 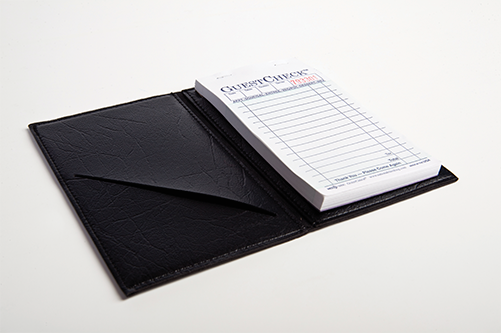 The AL-300 Guest Checks Holders are always in stock and ready to ship to your restaurant, catering business, institutional kitchen and, of course, your home.